The 2016 presidential election was full of surprises—one of the biggest of which was the role of Millennials on Election Day. We saw how the breaking of traditional models and expected patterns resulted in a seismic shift in Millennial attitudes and actions, ultimately challenging commonly held beliefs about who this generation is and what defines them. Today the Case Foundation and Achieve released the third wave of research for the pivotal 2016 Millennial Impact Report, which includes a special Post-Election Survey. Over the last year, we have been working together to research whether the Presidential election would influence Millennial cause engagement. And the results offer important insights into Millennial voting behavior and, more importantly, into their level of engagement on social causes that undergird our democracy. The survey confirms several developing trends that redefine how Millennials engage with issues and causes they care about the most. Most notably, where over three-fourths of Millennials believed they could affect positive change in the world in Wave 1 (March to May 2016), that number dropped to two-thirds by Wave 3 (September to November 2016). As Millennial respondents’ optimism in effecting positive change continued to decline during Wave 3; their cause engagement also decreased in the areas of volunteering, donating and participation in demonstrations. Decreased level of trust in the government and decreased belief in their ability to affect change may be behind this decline in cause engagement. 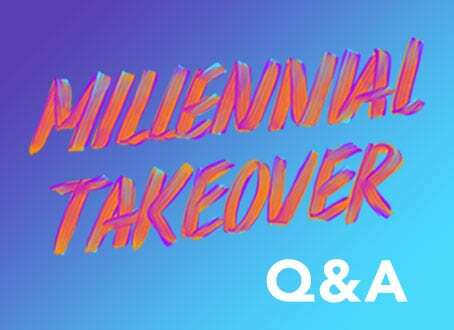 In support of these evolving generational trends, the Post-Election Survey results confirmed that Millennials voted for Donald Trump because of his business experience and new approach, and for Hillary Clinton because of her political experience and activism for minority groups. Those who chose not to vote did so from a combination of apathy, distrust and dislike. More Millennials identified themselves as conservative-leaning (rather than liberal-leaning or neutral) throughout the nine-month research period, and more conservative leaning Millennials identified themselves as activists. By the end of Wave 3, both female and male Millennials were less engaged in activities related to social issues they cared about with decreases reported in volunteering, donating and participation in demonstrations. Education remained the number-one cause issue throughout each wave of research before the election. Yet, post-election interviews revealed respondents moved away from this previously reported position, ranking employment, economy and healthcare before education. Throughout the nine-month study, researchers saw a significant disconnect between the number of Millennials who reported their support for Hillary Clinton and Donald Trump pre-election, and the candidate they voted for in the election. For example, in Wave 3 [September to November 2016], 21 percent of Millennials said they intended to vote for Donald Trump, yet 39 percent actually did vote for him. The 2016 Millennial Impact Report surveyed 350 Millennials every month from March to November, and immediately followed up with 350 of those interviewed after the election. This work builds upon the larger Millennial Impact Project that began in 2011 and has collected data from over 75,000 respondents. What does all of this mean? We’re not quite sure just yet—but hope to have insights to share in the final report out in March 2017 in which we synthesize findings from all three waves and the Post-Election Survey. What we do know is that just as this generation challenged the application of labels such as “apathetic” and “unengaged,” so too did they challenge many long held beliefs about their voting behavior and embrace of civic engagement throughout our 2016 research. In each of the three waves for instance, most surveyed identified as “conservative-leaning,” challenging the popular belief that most millennials are liberal-leaning. Indeed, this generation has consistently turned away from conventional labels, generalizations and stereotypes to define them and their actions—even when it comes to engaging for social good. To learn what comes next for Millennial cause engagement, Achieve and the Case Foundation will release a final report integrating the Post-Election Survey including qualitative data to create a more robust illustration of Millennials’ cause-related behavior during the 2016 election cycle. This comprehensive report will be released at SXSW in March 2017. To learn more about the 2016 Millennial Impact Project and view all the reports, including Wave 3 and the Post-Election Survey, please visit: themillennialimpact.com/2016-report.